What happens if I want to send my purchase back? We have many customers who have done just that. We are more than happy to refund your money as long as the goods are returned to us in a saleable condition. PLEASE NOTE THOUGH WE DO NOT REFUND CARRIAGE COSTS. Our full delivery and returns policy is detailed at the Bottom of every page or you can go there now by clicking here. Do you take all major credit cards ? Goggleyes accept all major credit cards. You do not have to have a Paypal Account to make a credit or debit card payment. To order and pay on line follow these simple steps. 1. Once you have filled your basket select check out. 2. You will be asked to register we do this to make sure that we get all of your delivery details correct before we lose you forever into the ether. 3. 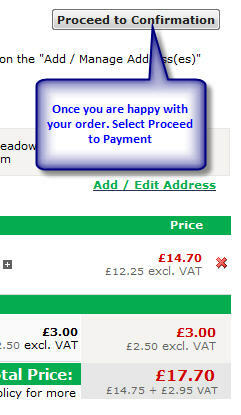 Now check your order and once you are happy select Proceed to confirmation. 4. The next screen you will see is the payment screen. 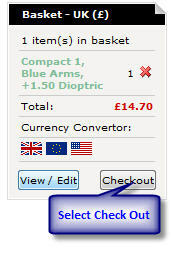 Select either the Paypoint option to pay by credit card or Paypal if you have an account with them. You can also pay by credit card with Paypal to do this follow the instructions. How do I know which Dioptre to chose? Always difficult if you haven't been to an optician and know your prescription. It really comes down to trial and error to find the strength of reader that suits your requirement. To help we have produced a simple chart which you can download and print out which you might find uesful. What is the Interpupillary Distance of your reading glasses ? Pupillary Distance is the industry standard in millimeters between the centres of the pupils. For Compact 1 and Compact 2 Readers and Sunreaders this is 62mm. Someone with training in the field of optics can accurately measure your pupillary distance, or you can make an approximate measurement yourself using a ruler, with someone's assistance or a mirror. The measurement will usually be taken twice: 1st with the patient focusing at a distance, and 2nd with the patient focusing at something close. The second measurement is used for reading glasses, and bifocals however the rule of thumb is that the so-called "near PD" will be 4 millimetres less than the "far PD" when the far PD is over 60mm, or 3 millimetres less than the far PD when the far PD is under 60mm. It is recommended, due to accuracy, to measure the PD with a pupilometer, however some practitioners take preliminary measurements with a millimeter ruler placed across the bridge of the nose. You can also measure your PD using a suitable photo and an online pupillometer. This method requires you to take a photo of your face with a ruler on your forehead or while wearing glasses of known length. To find your PD, you can use this photo in an online pupillometer or in any photo editing software that includes a 'measure' tool. Whats the difference between Dioptric Power and Dioptre ? Optical power or Dioptric power is the degree to which a lens converges or diverges light. The Dioptre is the most common unit of measurement of optical power. Do I have to have a Paypal Account to buy from Goggleyes? No you don't need a Paypal account you can pay with any debit or credit card. 4. The next screen you will see is the payment screen. You have two options. To pay by credit card without a Paypal account select the top option and pay by credit card. If you have a Paypal account select the Paypal logo to pay using that method. What do the different Goggle logo's mean ? We've tried to make it easy for you to select the product you are looking for. What if I want a product from Nannini which is not currently showing in the Goggleyes shop. Can I order it from Goggleyes ? Yes of course you can. The product will be more than likely in stock at the factory in Italy. How will I order my product then ? Once we know what you want. To do this just send us an Enquiry via the Contact Us link at the very top of the site pages. We will add the product to the shop, send you an e mail to let you know it's now available and you can place your order in the normal way. What is presbyopia (age related long sightedness ) ? There is an excelent article on NHS Direct which covers this topic. We've included a link here for you. You will receive an e mail from us at point of despatch. In the UK unless you chose the Next Day or 48 hour delivery options (extra cost) you can normally expect your order to arrive within 3 working days of receipt of the "Despatched" e mail. For other products other than glasses we use Royal Mail's standard parcel service to keep costs down for you. Shipping to other destinations outside the UK is very much dependant on the local postal service but from experience this is usually no more than 7 to 10 days. Your "despatched" e mail will give you more details.